Artist and professor of Arts Administration and Policy at the School of the Arts Institute of Chicago, Adelheid Mers will facilitate diagram-aided conversations about their practices with/among artists, managers, theorists and others who are open to sharing their thinking and experiences. Conversations will be fluidly traced on a Braid Whiteboard and a supporting cast of related diagrams. 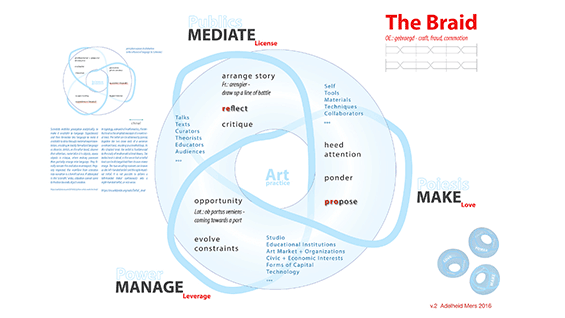 The Braid diagram presents three domains that may variously combine into an individual art practice, alliteratively tagged Making, Mediating and Managing.Borrowed from Topology, this visualization is intended to serve as an opening and is itself open to transformation by its users. Documentation is encouraged.